It's my first DesktopX theme. In 1.02 version you have the "About" button, to view the theme version and you have my informations, if you want to contact me. I have recently received comments about my theme and DesktopX 2. I have fixed it and it's supposed to work good. I found this to be one of the most well configured and attractive DesktopX themes of all times. A true work of art! Hi The_Artist, may I just ask, why did you made this a new upload? I think you should "update" your version 1 so people can download this version. Nice theme. Can you make a 1280x1024 version? It would allow a little more real estate on the desktop. COOL THEME, KEEP UP THE GOOD WORK !! I would love to see this in a 1280x1024 version. Nice work, would like to see it in different resolutions. like most people 1280 x 1024.
can you only use this in win xp? 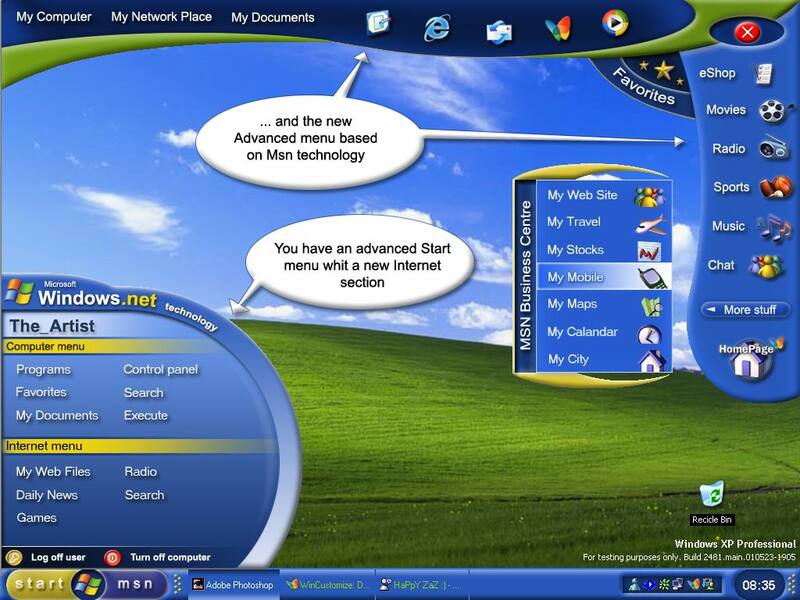 yes ... you can use this on Windows XP ! Why is it I don't get the menus across the top on this theme? I get the start menu etc, but none of that stuff you see across the top and down the right hand side.. how I get that? Great theme, Let me know when a version for 1400x1050 is ready! How do I get the same look as the one on the screenshot ? The same question as "Fearless MKO" posted 9/28/2001. I am new to this. Can someone help??? Hi - fantastic but I get an error message "Found popup objects without a popup starter object" - how do I get rid of this? Can anyone help...please email robsvoyage@hotmail.com....thanks people! Cheers!